Within the first year of your newborn's life, he will move through the classic stages of infant development. It can be a true joy for parents to watch their child progress through these stages and reach certain developmental milestones. However, some parents may foster concerns regarding their infant's progress. It is important to note that these developmental milestones have been charted by pediatricians to approximate a child's progress and not to create unrealistic fears or expectations. Still, these stages are important, and a child who is far off the mark may require investigation as to his development. The standard stages of infant development are typically divided up into three month increments. 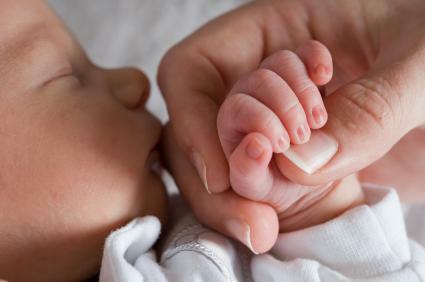 The first three months of an infant's life are classified as the newborn period. During this period of your time, a baby will begin to advance in the very basics of mobility. He will learn how to focus his eyes so that they no longer cross. By the end of this period, an infant will also learn control in the areas of holding his head up without aid and moving his arms and legs in a more coordinated fashion. When a newborn first comes into the world, he usually vociferates his needs through crying or screaming. However, somewhere around this three month period, many babies will learn alternative forms of communication such as happy squeals and even giggles. During the initial three months of an infant's life, most parents will experience the thrill of seeing their baby's first smile. Around the fourth month of a baby's life, many exciting developments will take place. Some of these developmental leaps will require a parent to keep close attention over her child. By the time the average infant reaches six months, he will have learned to grab objects, sit up without assistance, crawl in many cases, and display an oral fixation. Around four months, many infants will begin the teething stage, which may be characterized by excessive drooling and an increase in crying. Equipping your infant with cloth bibs during the daytime can help to absorb some of the drool that will otherwise end up on your carpets, floors, and furniture. Furthermore, giving your child safe chewy toys can prevent your baby from chewing on other household objects. A baby's overall increase in mobility will make baby-proofing your residence a must. This already presents a drastic lifestyle change for parents who were just beginning to manage their previously sedentary newborn. Communication will also evolve during this time, as many babies begin to babble by about the four month mark. During this developmental stage, your child's eating patterns may change. Many parents will introduce their baby to solids, though others will wait until the nine month mark. By the six month period, infants are far more mobile and require more calories to function and grow properly. Talking to your pediatrician about dietary options and feeding plans is important for potentially warding off allergy problems and giving your baby adequate nutrition. Crawling and socializing will really take off at this time. Again, the necessity of baby-proofing cannot be overstated, as crawling infants will begin to get into everything. Drooling and chewing on available objects will also persist and increase. Some infants will begin attempts at speech by this time, but words are usually limited to the most classic examples of "Mommy" and "Dada". This period of development is by far the most exciting, as your infant will already be a little person by now. Walking - Some particularly eager children will start taking their first steps, even as early as ten months. It is very common for babies to hold onto the furniture for guidance as they explore the act of walking upright. Somewhere within this period, your child may also learn to stand without support; a very exciting moment for parents. Eating - Your baby will be moving quickly into the realm of crunchy textured solid foods and may be learning how to drink out of a regular cup. Talking - Basic words will be firmly implanted in the average toddler's vocabulary. Your child may also begin to recognize patterns in his life and may express distress over the concept of an object not being in its usual place. Playing - Another wonderful perk of this developmental stage is that children often become more self-sufficient in the way of entertaining themselves. Whereas a newborn is completely dependent upon a parent for most of his needs, babies approaching the toddler stage are often capable of fascinating themselves with toys and objects, thus freeing up some time for tired mothers. Napping - Still, the downside may be that your toddler is ready give up one of his napping periods and may be napping less overall. One way to mitigate concerns over these stages of developments is to keep close ties with a pediatrician who is capable of recognizing advancements and deficiencies. Many parents foster paranoia when their child fails to develop as quickly as her peers. Sometimes an infant may be several months behind when it comes to a particular milestone, especially where premature infants and multiples are concerned, but this isn't necessarily a cause for alarm. However, parents who are not quietly charting their child's growth may miss an important signal. Hence, to allay any growing fears, it is best to have your child examined during each stage so as to rule out any underlying conditions.